EZX provides a suite of advanced trading tools, that include a powerful API, a full function EMS/OMS and a fully managed FIX routing network that easily integrates with your Java, .NET, C raw sockets, or Excel applications. EZX supports trading in Equities, Futures, Options, Fixed Income and FX. iServer is EZX’s flagship product that provides clients with a robust, broker neutral Trading Platform delivered as a fully managed Service. iServer offers a platform independent API, an integrated Trade Blotter (EZoms), pre-certified FIX connectivity, and world class service and support. The iServer API integrates easily with your Strategy/Algo engine, custom trading screen, or Excel spreadsheet so that you can get your strategies live quickly and lower your operating costs. The iServer performs FIX version normalization, state management, FIX destination routing, and supports FIX versions 4.0 thru 5.0, including custom tags and FIX variants. EZX supports tool kits in Java, .NET, COM, and Real Time Data for Excel spreadsheets so the API can be used in a variety of software development environments. EZX makes electronic order routing faster, more reliable and cheaper without the headaches of more traditional systems! ◦ One API message format to all destination. ◦ Support for Parent Orders. ◦ Tracks state of all orders. ◦ Handles execution cancel and correct. ◦ Reduces errors and support problems. ◦ Traders can to view status of black box trading. ◦ Drop copy data to third party systems (Clearing, Compliance, Analysis). Testing & Certification handled by us, not you! ◦ Minimal client testing/certification required. ◦ Hosted evaluation server can be leveraged to test with destinations. ◦ Testing with simulator reduces/eliminates need for broker testing. ◦ Saves significant time in getting into production. ◦ Experts in dealing with the FIX Protocol. EZX’s Real Time Data plugin for Excel, EZexcel, gives you the ability to FIX enable your spreadsheets so you can automate your strategy right from your desktop. With EZexcel, you can make your Excel Spreadsheet an Execution Management System without the hassle and cost of a large system implementation. EZexcel plugin allows traders to quickly and easily send orders, amend them and cancel them without any coding. Easily run complex trading strategies from any Excel spreadsheet. Utilizing EZexcel you can trade with any of our Certified Destinations right out of the box. EZX can help you create your strategies and provides you with a fully working trading blotter (EZoms) that can be used in conjunction with EZexcel. • Build a quick and simple user interface to your custom needs. • Focus on the strategy not building a custom application. • Create analytics on your trading quick and simple. EZfx is a real-time aggregator of access to the FX marketplace. EZfx provides a simple to use interface that allows you to connect to multiple FX destinations through our normalized API. Using the EZfx API, you can quickly start receiving market data and sending order flow to Banks, ECNs, and other FX liquidity pools. As you wish to add additional trading partners, you have little or no additional development work to do. 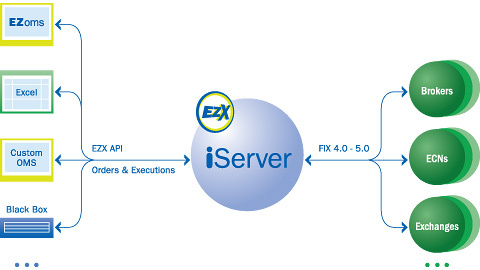 EZfx is built using our proven iServer platform and is fully managed and operated by EZX. This allows you to focus on developing and growing your strategies. • Co-Located in NY4 with low latency cross connects. • All FX trading destinations already available. • Easy to integrate normalized API. • Extremely short time to market. • Fully managed connectivity service. • Professional Services available to help integrate and implement your strategies. • With EZX, you can stay focused on your strategy. EZoms is a full function OMS/EMS that comes with many important features but does not carry the bloat of larger scale products. EZoms provides integrated market data, level II screen based trading, quick order entry, working/staged orders, importing/exporting of files from external systems, integrated broker Algorithms, Dark Pool access, and multiple user and group administration. EZoms Is built on top of the iServer infrastructure so you get all the benefits of our fully managed FIX connectivity for Equities trading , and Options, Futures, and FX order routing. EZX built EZoms for clients who need a quick way to trade, need to view and manipulate their black box or algorithmic engine’s order flow, or simply need a starting point for a proprietary trading blotter. For an evaluation version of EZoms please contact sales@ezxinc.com or call 908.376.1445. • Trade with all your brokers from a single screen. • Support for multiple order types, time in force. • Support for Discretionary and Reserve orders. • Supporty for Third Party Portfolio Management Systems, EMS and other OMS. • Can float or dock any screen. • Ability to hide or show columns. • Import any file format that can be parsed. • Can import from Excel. • Customized for each client. • Can support multiple file formats. • Can check against external systems. • Block orders from being sent. • Can aggregate orders and track overall position. • Can cancel and replace. • Integrated with many of the popular Dark Pools. • Support for most major broker algos. • Easy to add new ones. • Built into order entry screens. EZbd was built to provide a complete electronic trading system for agency Broker Dealers. It supports multiple offices and clients, OATS, ACT, OTS, Allocation reports and all other compliance required end of day process. 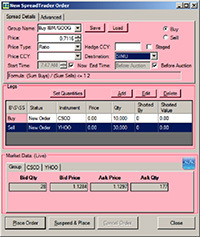 EZbd supports integrated market data, quick order entry screens, Level II integrated market data, and risk limit checks available on both the client and the server. EZbd Is built on top of the iServer infrastructure so you get all the benefits of our fully managed FIX connectivity. EZX handles all the setup, monitoring and maintenance of the servers and the connections to the various destinations, all for a low monthly cost. EZbd was built to be customized to our clients needs. We can easily modify the functionality and behavior to meet your specific business model. As an added benefit , EZoms can be “White Labeled” and deployed to your clients that need a trading blotter to send you order flow. We also have extensive experience building and deploying custom strategy screens such as Pairs and Spreads for our broker dealer clients. • Fully Managed Service Bureau. -No equipment to order or host. • Access US Exchanges & ECNs. • Support for Equities Trading, Options & Futures Order Routing. • Compliance reporting for OATS and OTS. • Support for Drop Copies to Clearing Systems. • Integration with Mezzoware and other Back Office systems. • Customizable screen layout and Alerts. • Integrated Market Data optional with full Depth information. • Custom Filters available to see orders by Client, Office,Firm or Trader. • Handling of Staged and fully routed orders. • Supports Pink Sheet and Bulletin Board stocks. • Inbound Electronic orders via FIX. • Native broker Algorithm support to all major brokers. • Import information from external systems including spreadsheets. • Customizable end of day allocation processing. Take control of your order routing with EZX’s state of the art FIXengine. Whether you want to break away from relying on OMS vendor provided routing networks or just looking for a reliable and professionally supported FIX engine to integrate into your proprietary trading system, EZX’s FIXengine is the right choice. The EZX FIXengine features support for FIX 4.0 thru 5.0, local variants, custom tags, FIX session management, FIX session and application message validation, multiple FIX sessions, multiple API sessions, API event driven notification, and aJava based API. We also provide key operational features such as a Scheduler that manages end of day processing, connects and disconnects, and connection monitoring. Also included is a re-synchronization mechanism for the API interface and a real time engine status mechanism. EZX can also provide the EZX FIXengine as a fully managed service including certification and connectivity services. • Low latency and built in latency monitoring. • Can run hundreds of connections on a single instance. • Built into the engine is a latency and throughput monitor. • Writes automatically out to the log files. • Can monitor for latency problems real time. • Replicates database of engine across servers automatically. • Allows for redundancy and low latency. • Can validate all versions of FIX and be customized. • Can be configured to turn on and off different levels of validation. • Can add, remove and modify connections without ever stopping the engine. • Allows for running on a 24/7 schedule without the need to restart. • Allows for easy integration to any language or platform. • Can wrap into other middlewares. • Keeps engine more maintainable and stable across releases. • The engine has the ability to set Connect, Disconnect, End of Day and Engine End of Day processing. • Can apply schedules across multiple connections. • Can at a message type level tell the engine to queue, reject or expire messages depending on the connection state. • Uses Test Requests to track messages received by other side. • Reports expired messages over the API. • Written in Java to run on Unix and Windows platforms. ◦ Configure the engine and all connections (no hand coding of XML). ◦ Connect, Dissconnect, EOD individual or groups of connections. ◦ On one dashboard see the status of all FIX connections. • Receive instant messages for critical status changes of the engine ( i.e. a connection going down during scheduled up time ). EZX provides a fully managed solution that is hosted in Equinix’s NY4 SAS70 data center. Whether using our iServer, EZoms, FIXengine or FIXhub, our data center provides a high level of reliability so you can be confident that our solutions will be stable and robust. EZX can also provide rack space in NY4 or any of the major exchange data centers for your strategy servers utilizing our high speed connections to major markets center access points. • Prime SAS70 Equinix NY4 location. • No need for buying circuits to different destinations. • EZX handles all connectivity issues. • Support for Broker Algos and Dark Pools. • Digital certificates, allow fast and secure set up. • Multi execution destination support. • High Speed connections to liquidity centers. The EZX Strategy Development Platform is a complete solution for developing and implementing your proprietary trading strategies. SDP is a core set of software components for building and running world class trading strategies. If you have a trading idea, you can quickly and easily take your strategy from concept to production with EZX Strategy Development Platform. • GUI applications for control and monitoring of your strategy. • Complex strategy logic implementation. • Available as a licensed software package or EZX will custom build your strategy to spec. • Low Latency trading infrastructure and connectivity through our industry leading iServer solution. The EZX FIXhub Solution provides an easy and cost effective way to maintain your own FIX gateway. Using EZX FIXhub gives you ownership and control of all your FIX based electronic connectivity but provides the benefits of being a managed solution. This hybrid solution gives you the best of both worlds, your own dedicated FIX gateway with little or no internal IT resource requirements. • Have as many inbound FIX connections to your gateway as you need, but appear as a single connection to all counter-parties to reduce other vendor costs. • Maintain control and independence from OMS and other FIX network vendors. • Quickly and easily onboard new FIX sources and destinations at your pace, not your vendors. • Overcome limited connectivity options of your clients who may be stuck with vendors who are not responsive. • Flexible routing, filtering and mapping modules make creating complex rules easy. • Your clients names can be hidden from all counter-parties (All regulatory rules apply). • Access to EZoms (EZX’s robust OMS) to monitor and interact with all the order flow through the gateway. • EZX’s highly experienced staff of FIX experts becomes your FIX support team. For more information on any of our products please contact sales@ezxinc.com or call 908.376.1445.